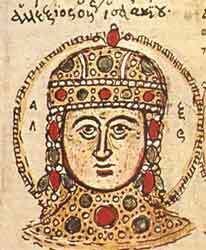 Alexius IV Angelus (Greek: Αλέξιος Δ' Άγγελος)(c. 1182-1204) was Byzantine Emperor from July 1203 to January 1204. He was the son of emperor Isaac II Angelus and nephew of Alexius III Angelus. The young Alexius was imprisoned in 1195 when Alexius III overthrew Isaac II in a coup. In 1201, two Pisan merchants were employed to smuggle Alexius out of Constantinople to Germany, where he took refuge with his brother-in-law Philip of Swabia, who was married to his sister Irene. While there he met with Boniface of Montferrat, Philip's cousin, who had been chosen to lead the Fourth Crusade, but had temporarily left the Crusade during the siege of Zara to visit Philip. Boniface and Alexius discussed diverting the Crusade to Constantinople so that Alexius and his father could be restored to the throne; in return, Alexius would give them Byzantine soldiers to help fight the Crusade, as well as money to pay off the Crusaders' debt to the Venetians. Additionally, he promised to bring the Greek Orthodox Church under the authority of the pope. The Venetians were in favour of this plan when they learned of it, and in 1202 the fleet arrived at Constantinople. Alexius was paraded outside the walls, but the citizens were apathetic, as Alexius III, though a usurper and illegitimate in the eyes of the westerners, was an acceptable emperor for the Byzantine citizens. In 1203 the Crusaders launched an assault on the city, and Alexius III immediately fled. The next morning the Crusaders were surprised to find that the citizens had released Isaac from prison and re-crowned him as emperor, despite the fact that he had been blinded to make him ineligible to rule. The Crusaders could not accept this, and forced Isaac to proclaim Alexius IV co-emperor. Despite Alexius' grand promises, Isaac, the more experienced and practical of the two, knew that the Crusaders' debt could never be repaid from the imperial treasury. Alexius however had apparently not grasped how far the empire's financial resources had fallen during the previous 50 years. Alexius did manage to raise half the sum promised, by taking from the church and by confiscating property of his enemies. He then attempted to defeat his uncle Alexius III, who remained in control of Thrace. The sack of some Thracian towns helped somewhat, but meanwhile hostility between the restive Crusaders and the inhabitants of Constantinople was growing. In December 1203 violence exploded between the Constantinoplites and the Crusaders. Enraged mobs seized and brutally murdered any foreigner they could lay hands upon, and the Crusaders felt that Alexius had not fulfiled his promises to them. Alexius refused their demands, saying, "I will not do anymore than I have done." At the same time relations were deteriorating with the Crusaders, Alexius had become deeply unpopular with the Greek citizenry, and with his own father. Blinded and nearly powerless, Isaac II resented having to share the throne with his son; he spread rumors of Alexius' supposed sexual perversity, alleging he kept company with "depraved men". The chronicler Nicetas Choniates dismissed Alexius as "childish" and criticized his familiarity with the Crusaders and his lavish lifestyle. On the night of January 27-28 1204 Alexius IV was deposed by the leader of the anti-western party, Alexius Murtzouphlos. Isaac II soon died, possibly of old age but possibly from poison, and Alexius IV was strangled on February 8. Murtzouphlos was proclaimed emperor as Alexius V.